Wednesday evenings sailing and a Party! As with all other events this season the Wednesday evening racing is proving very popular with 15 – 20 boats on the water most weeks, encouraged by the delicious suppers prepared by Geesje after the race – some of us just come for the supper! This week was no exception with some 26 boats racing, in lovely warm sunshine and a good breeze – including young Haidy, racing for the first time – well done Haidy. But there was the added attraction of it being Jerry's birthday, which of course was an excuse, as if we need it…..for a party!! A surprised Jerry arrived to see balloons and bunting all over the deck and a chorus of Happy Birthday from the assembled company all madly rigging their boats. It was a great course set by Chris and his team, perfect for the spectators on the deck with the start line from the shore transit to the 1st mark 4. Everyone was on the line, no one over, a lot of shouting, with Mark very bravely starting at the shore end on port and crossing most of the starboard fleet! While the wine flowed on the deck the racers enjoyed their sail, with Ian finishing 1st, Newton 2nd and Mark 3rd. There was a great atmosphere when everyone joined the birthday boy and all sung Happy Birthday when Ellie's spectacular cake appeared – no doubt how old Jerry is now…!!! And just to complete a great evening we had a surprise visit from Roger, it was great to see him. What a great summer it has been so for the Pirates, despite the earlier poor weather, which has not deterred our young people. Numbers on the water have gone up and up, with 41, 2 weeks ago and 83 on the Pirate register! Wow we hope they don't all come together….. Thanks to our very supportive team of power boat drivers, Dads, Mums and even Granddads, we are able to put out 4 power boats, if needed. The standard of sailing has improved at every session with the older, stage 2 / 3 helping the little, inexperienced children – ages range from 5 – 16 yrs amazing! We had 2 ex Pirates Bryony and Oliver visit last week, back from Uni, great to see them. The atmosphere on these evenings at the club is wonderful, seeing the future of the club 'getting to grips' with proper sailing and the occasional race…long live the Pirates..!!! What a glorious day it was, some wind and lots of sun and the need for the gazebo, for some shade, to be erected. The boat park was very busy with some 20+ boats getting ready for the race – for some who had camped overnight, it was an early morning sail or canoe before breakfast as well. Paul and Barbara did so well providing 30 Pink Fleet breakfasts. After Ken's briefing on the deck, we started from the club transit, with 6 the first mark, then 9s, 4s, 8p and back through the line to 6. Monica, Alice, Mike and James had a good swapping of places throughout the race. While the boys enjoyed the club Sport 14, Tracey in her Leader with Carole, lots of yougsters in club boats, Allister and Grace in their Topper looking very relaxed…..was it as a result of having a good time at Henley Festival the night before…….rumour has it that he spent the afternoon in a hammock before returning for the BBQ in the pm and to join the campers?!! The undoubted winner of the coverted Pink Fleet cup was Gary who managed to get all tangled up in his sheets and capsized at no 4 – nice one Gary!! There was a brief respite, lounging in the sun, splashing about in kayaks and surfboards before…. Pirates began at 1400 with a briefing from Gary at the log. Everyone had to put a bottle of water on a mark and retrieve it, then there was 'follow the leader', all around the lake on the outside of all the buoys. The usual capsize practice, some towing and finally general mayhem with everyone just having fun….. The rest of the afternoon saw Bernadette, Nathalie and Barbara, busy in the galley, Jerry getting the BBQ ready, lots of people young and old messing about in boats or just cooling off in the water, before everyone just chilled out with a glass or 2 and enjoyed an amazing feast. Even the commodore and his lady wife were seen going out for a sail in their Enterprise, a wonderful sight. The commodore does know how to sail!!! The sailing, swimming continued well into the night…….but everyone had a fantastic time…Tracey made it to her tent alone. Monica wimped out and went home to bed – old ladies do that – and Laura 'saved the day' by doing a mega shop and coming back with all the forgotten goodies for the BBQ and breakfast in the morning. The club was a hive of activity by 0700, some swimming, some sailing and others still sleeping….all the wine had been drunk the night before!! Jerry stocked up the BBQ and breakfast bacon was cooked on that, with Elaine busy in the galley, making coffee, tea, and toast, finding rolls, baguettes from the depths of the freezer, meeting everyone's dietary needs. The week end was a great success with most people 'mucking in', clearing up rubbish – great job Maurice – cleaning pots – you are as good guy Gary – club house cleaning, well done, Debbie, John, Rupert Mark and many others. …as the commodore said…" 75 people had a brilliant time, the weather was perfect and many thanks to everyone who helped and made it all possible…"
The Sunday racers arrived with all the boat rigging areas cleared, but even after the race many people either just stayed on for another sail – the wind got up in the after noon – or just came back to chill out on and in the water on the hottest day of the year. Congratulations to Brian and Richard on a successful course with four newly qualified power boat drivers. One of the founder members of RSC. Bill, was seen out in his Heron today having celebrated his 90th birthday last Sunday with his family at a surprise party at the Runnymede Hotel, including a boat trip up the river. He was thrilled but said he would have preferred to have been in a boat with a sail!! He often pops down to the club and has a quiet sail, pulling his boat out with his car!! An amazing guy, having had serious illness and 2 new knees in the last few years. 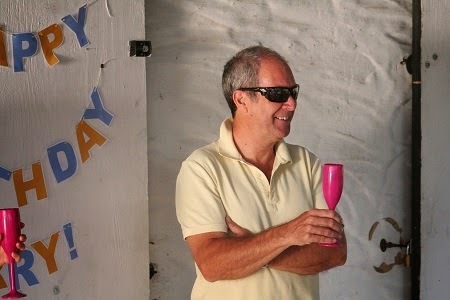 All at Reading Sailing club wish him many more sailing years to come and many congratulations! This racing report was missing in action, like some of the OOD crew by the sound of it. Sorry for the delay. It was going to be a hot day. The hottest day of the year . A swelling 24 degrees C. The wind was picking up even when the sailors were getting their boats ready. I felt Rod was going to have an eventful time on his hands. The course consist of a long beat followed by a dead run down the whole length of the lake. The first person to sample the lake water was Richard. He performed too many rolls and capsized backwards. It was a testing part of the race. Karen was struggling with the strengthening wind and she wasn’t in her usual position towards the front of the fleet. Due to the reduced numbers in Rod s team, he was struggling to run the race. Oswin , bless him soon realised it has been a long time since he last sailed his laser. 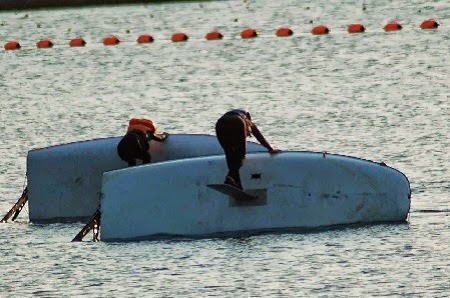 And he was having severe difficulties with his boat and his boat punished him by whacking his boom over his head. Next time Oswin keep your head down! He sailed back to shore for immediate first aid. A final note has to be mentioned on this report due to the members in Rods team not turning up. Rods team were having problems rescuing people and still running the race. we could of had a dangerous situation occur . So please if you are on duty please, please turn up to do it. A lovely sunny day and under staffed SOOD, Peter Rose set the course for what looked like a drifter but typically, after the start sequence began, the Sun did it’s work and conditions picked up nicely. Newton was called back at the start for being over the line; meanwhile, Andy in his Merlin ploughed ahead and looked splendid with spinnaker flying, lasers in hot pursuit. In the lower orders Jon mack did battle with Monica, keeping in touch until nearly the end, whatever happened on that last lap? Extreme sailor Steve in his 505 was impressive, often seen heeled over in dramatic fashion before missing out buoy four and finally coming to grief near buoy X with his mast stuck fast in the mud. 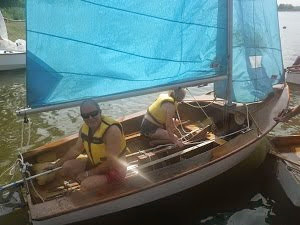 Peter and his one helper had to rescue the boat after the race, just as well no one else got into trouble!! Andy retired on what must have been the last lap to leave the field open to the usual suspects; Richard, Chris and Karen in lasers, Ian in his Supernova and Paul flying the flag for the Enterprise class. It really doesn’t get much better than this, an excellent sail. Results: 1st Richard, 2nd Chris, 3rd Ian. Remember the racing rules are in effect from the momemt the preparation signal is made, and that collision regulations apply prior to then. If you are unsure please read the rules or ask another racer – don’t get a DSQ ! !